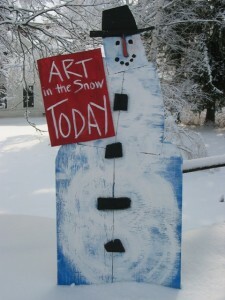 Art in the Snow: Brandon’s Winter Arts and Wine Festival continues this year on February 18-19. 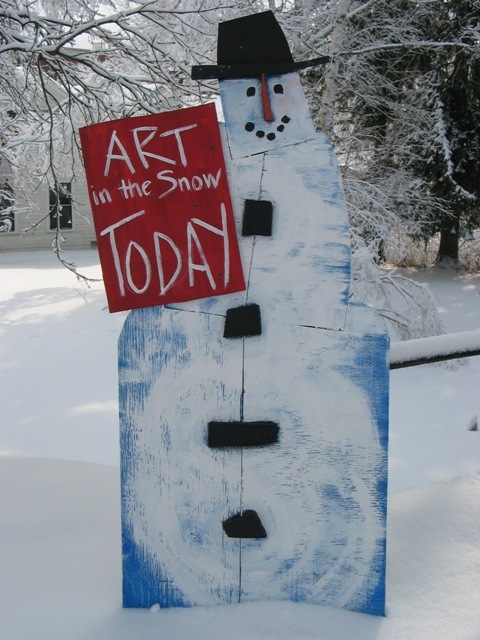 The Art in the Snow open studio weekend — a long-time tradition of the Brandon Artists Guild — has evolved and expanded with still more accompanying wine events this year. Those visitors concentrating on the art venues are invited to talk with artists and craftspeople in their studios, see them at work in their natural environment. Among the local artists whose studios are open to the public for the weekend are Warren Kimble in his expanded year-old gallery/studio, Judith Reilly in her historic home with a first-floor gallery and colorful studio upstairs, Lee Greenwalt at the Granary, and Joan Curtis on Union Street. Some artists and craft artisans (for example, Debbie Kirby and Nancy Meffe with, respectively, hand-spun/knitted items and beautiful weavings) will greet visitors at the Brandon Inn and at the BAG’s “Bagette” in the Granary buildling on Union Street. Additional artists demoing in public space at the Granary include Karen Deets (stained glass), Mike Mayonne (painting), Jill Listzwan (jewelry), Barbara Ekedahl (woodprints on maps), Meg Brash (jewelry). Those with their own studios in the Granary are Coliene Moore (jewelry), Jackee Folee (painting), and Patty Sgrecci (mobiles). Susan Smith-Hunter will open her pottery sculpture studio at 4 Railroad Av just behind the Granary. As always, the Brandon Artists Guild will be open, with the artwork of more than 45 artists and artisans on display. There will likely be a few art demonstrators present at the Guild and elsewhere; and the “raffle” items (see below) are also on view at this spot. Start at the BAG, in order to obtain up-to-the-minute details on places to go, art to see, wine to taste. Good News: The free-of-charge raffle is back. Stalwart sight-seers attending at least ten locations, who have their maps stamped at each locale, are eligible to enter the drawing. Winners will be announced on Sunday afternoon (presence not required). * Wine tasting venues all over town!! Please keep checking here and on the Brandon Chamber site for updates.